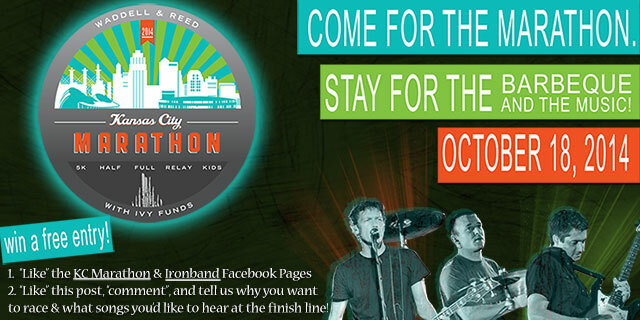 Ironband | 2014 Waddell & Reed Kansas City Marathon- Win a FREE Race Entry! The full music schedule is still in development but rest assured that all your training and race-day efforts will be rewarded with a great lineup of music, BBQ and cold refreshments at the finish line! Have you registered? The Kansas City Marathon and Ironband have teamed up to give away a few complimentary entries over the next few months. Whether you want to run the full marathon, the half or the 5K – follow the steps below and we’ll draw our first winner from the comments on Friday, March 14th! “Like” the post on the @ironbandmusic page featuring the photo below, comment, and tell us why you want to race & what songs you’d like to hear at the finish line festival! Lace up those shoes, stay tuned on Facebook and we’ll see you on October 18th!